– 24×7 Asterisk server monitoring with Nagios. 24×7 Asterisk server monitoring with Nagios. We offer an economical solution for end users and resellers to monitor their Asterisk and Linux servers. Our platform monitors servers 24 hours a day 7 days a week. Hosted in a state of the art US based data centre with connections to major UK data centres and multiple connections to the internet. 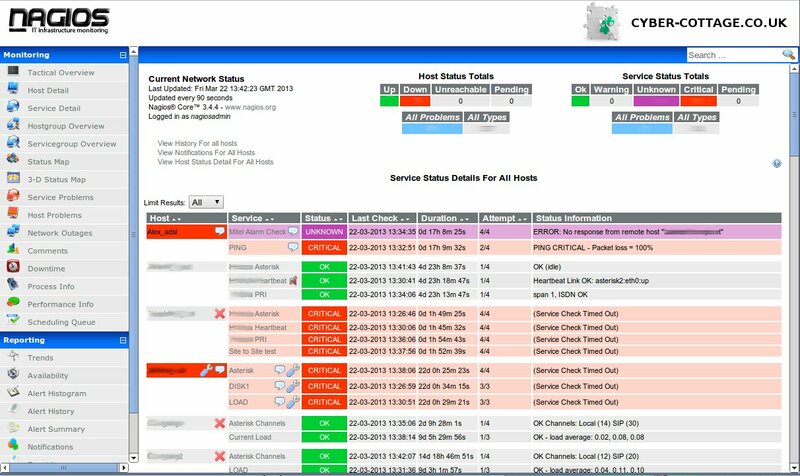 We offer different levels of monitoring from simple uptime and email alerts to system load, disk space and channel usage with email and SMS notification. Web panel and firefox/Chrome plugin available to all levels to view system status. The service is primarily aimed at Asterisk based IPPBX server but we can monitor other Linux based servers and Mitel systems as well. Our checks on Asterisk servers were customised by us to allow easy and secure deployment as we only require SSH access to make checks and this is secured by server keys. Single Server, 4 services from list below & email alerts. ← The snow is coming – and don’t we all just love a snow day?